You can record sound directly from Storyboard Pro and insert it in the timeline. In the Timeline view, add a new audio track if needed. Position the play head at the frame you want your recording to begin and select the audio track you want to record your sound guide in. In the top menu, select File > Import > Record Sound. In the Sound toolbar, click on Record Sound . Select the New Audio Tracks option to create a new audio track for the recording. Select the Current Audio Track option to record in the selected audio track. Select the First Frame option to start the recording on the first frame of the project. Select the Current Frame option to start the recording on the current frame. 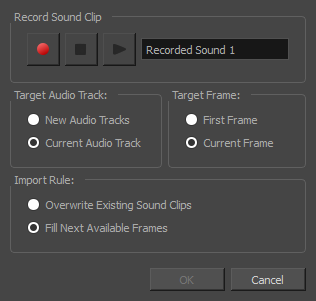 Select the Overwrite Existing Sound Clips option so that the resulting audio clip will be position in its entire length, overwriting any existing clip positioned in its way. Select the Fill Next Available Frames option so that the recording do not overwrite the position of existing audio clips that are on the same audio track. Type in the name you want for your audio clip. Click the Record button to start the recording. Click the Play button to preview the recording.